According to Ayurvedic medicine there are three main types of digestive imbalances, each one relating to a specific doshic imbalance. Since the digestive fire (known as Agni) is the ruler of our overall health, it is vital to know your digestion type in order to utilize the appropriate diet, lifestyle and herbal regimen for you as an individual. 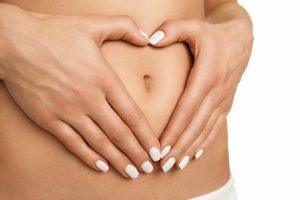 Whether you are looking to treat a disorder or simply maintain a high quality of wellbeing, working with your digestion type will offer you a clear pathway to optimal health and healing. How we digest our food is directly correlated with our level of health. If an individual is eating a “healthy” diet but is experiencing gas, bloating and constipation after meals, then that healthy food is likely not healthy for them. When food is not being digested properly (even the most healthiest of food types), the nutrients are not being properly assimilated and absorbed leading to symptoms of indigestion, toxic accumulation and malabsorption. Unfortunately this is a common phenomenon among many individuals, leading to a large amount of frustration and confusion around what to eat. 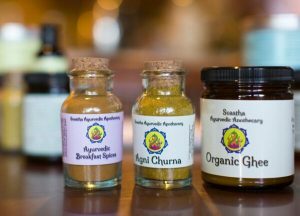 Below is a brief introduction to each of the Ayurvedic digestion types. Please note that although there are three types of digestive imbalances, there are actually four digestion types; the forth one being Sama Agni or “balanced digestion”. Although Sama Agni is a wonderful goal to strive for, it is a fairly rare occurrence to obtain without great care and proper treatment. More than likely, you may currently fall into one of the other three types of digestive imbalances, so please read the charts carefully to discover some basic ideas to bring your Agni back to balance! 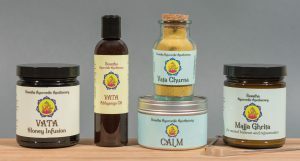 The first of the Ayurvedic digestion types is known as Vishama Agni (translated as “irregular fire”) and is related to an imbalance of Vata dosha or the wind element in the body. Like Vata dosha, the symptoms are often fluctuating and irregular. You may experience symptoms such as constipation, gas, bloating, fluctuating appetite, irregular bowel habits, forgetting to eat, spaciness with hunger, anxiety, restless mind, excessive worry and sporadic mood changes. If there is a coating on the tongue (which showing toxins in the system) it is often brownish in color. Individuals with Vishama Agni often do not digest proteins (e.g. most beans and heavy meats), nor raw foods (e.g. raw vegetables, raw nuts and green juices) well. 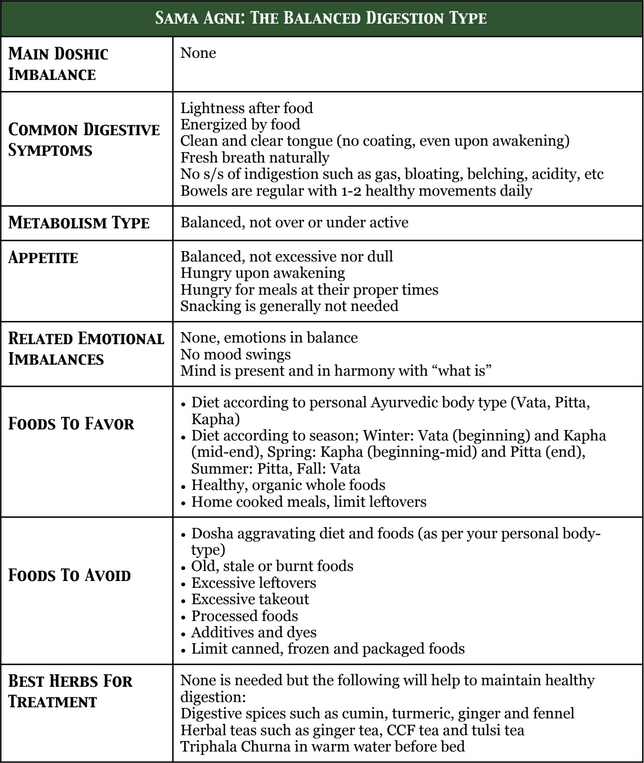 Here is a brief chart that shares some of the general factors for diagnosing and alleviating Vishama Agni. If you are experiencing Vishama Agni, it will be best to follow a Vata-pacifying diet routine. Warm well-cooked, mushy meals such as kitchari, dahls, basmati rice, soups, stews, crock pot meals and well-steamed veggies will be beneficial while all cold, raw, dry and rough foods should be avoided. Warming digestive spices will help to reduce symptoms of gas and bloating and taking Triphala Churna with ghee at bedtime will help to relieve constipation. Click here to read more on a Vata-pacifying diet. Click here for more tips on how to treat constipation. Click here for more tips on how to treat gas and bloating. The second digestion type is related to Pitta dosha or the fire element and it is called Tikshna Agni (translated as “sharp, penetrating fire”). Like Pitta the symptoms relate to excessive heat in the system and can range from hyperacidity, acid reflux, hyper-metabolism, constant hunger, hypoglycemia (low blood sugar), inflammation in the GI tract, diarrhea, chronic loose stools, cranky hunger, anger, criticism and judgmental tendencies. If a coating is present on the tongue it often has a yellow, orange, pink or green hue in color. Individuals with Tikshna Agni often do not digest oily, fatty, fried foods well and cannot tolerate foods with extreme spice (although they tend to love it!). Here is a brief chart that shares some of the general factors for diagnosing and alleviating Tikshna Agni. If you are experiencing Tikshna Agni, it will be best to follow a Pitta-pacifying diet routine. Cooling foods should be utilized such as ghee, coconut, dairy, lime, cilantro, cilantro juice, aloe, pomegranate, dates, cucumber and watermelon while all spicy, sour and salty foods should be avoided. All inflammatory foods should be removed from the diet as well as fermented foods, both of which will increase the heat in the system. Cooling digestive spices will help to balance the overactive fire and treat symptoms such as hyperacidity, inflammation and loose stools. Drinking CCF Tea between meals is an effective way to strengthen the digestive fire without creating further heat in the system. Click here to read more on a Pitta-pacifying diet. Click here for our CCF Tea recipe. Click here for our Cilantro Juice recipe. The third digestion type is known as Manda Agni (translated as “slow, sluggish fire”) and is correlated with a Kapha imbalance in the GI tract. 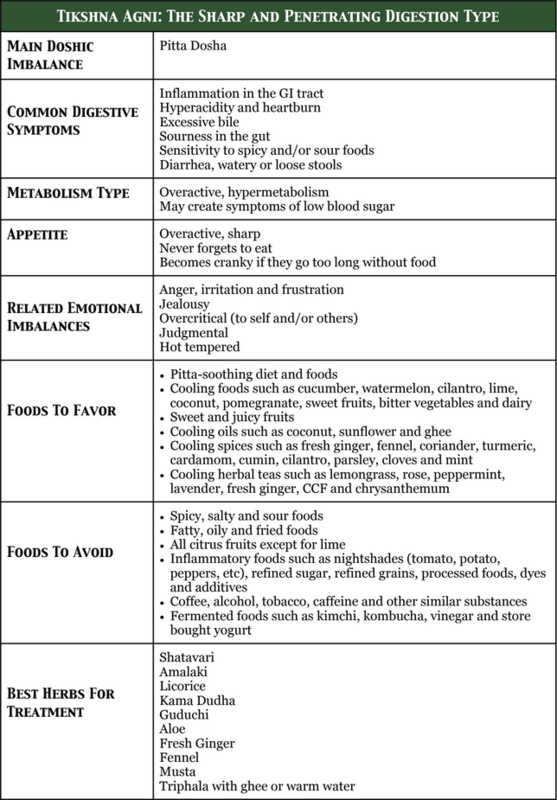 Common symptoms of Manda Agni include a dull appetite, sluggish digestion, slow metabolism, heaviness after food, sleepiness after food, excessive weight gain (even with small amounts of food intake), water retention or edema, depression, emotional eating, lethargy, attachment and intense cravings for sweet or salty foods. Manda Agni almost always correlates with a heavy coating on the tongue and it is often thick and whitish to off-whitish in color. Individuals with Manda Agni often do not digest heavier food types well such as refined grains (or all grains in some cases), gluten, wheat, meat, eggs, dairy, sweets and oily foods. Here is a brief chart that shares some of the general factors for diagnosing and alleviating Manda Agni. If you are experiencing Manda Agni, it will be best to follow a Kapha-pacifying diet routine. Light, easy to digest foods should be favored such as lean protein (fish, chicken, chickpeas, mung beans, red lentils, egg whites), steamed veggies and light grains (millet, quinoa, buckwheat). 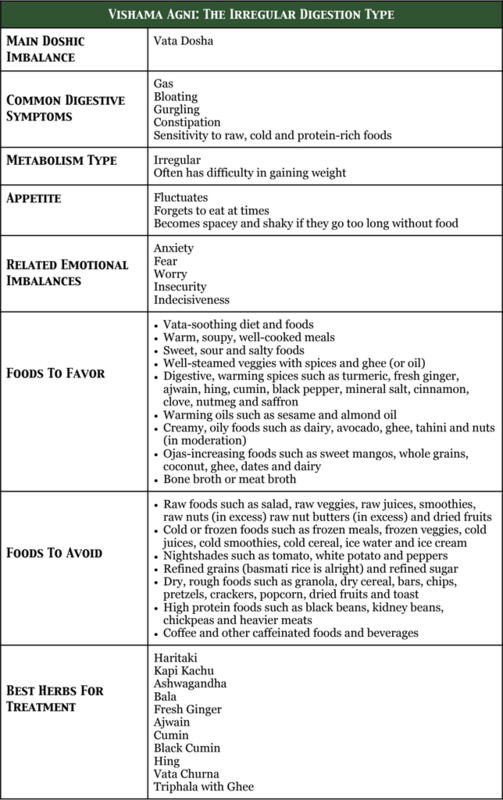 It will be extremely important to avoid all heavy, dense food types such as meat (esp. red meat and pork), cow milk, cheese, store bought yogurt, starches, refined carbs (pasta, bread, white rice), refined sugar, sweets, fatty foods and salty foods. Snacking should be avoided and all food should be eaten by 6pm each night. Taking a digestive stimulant before meals such as the Kapha Honey Infusion, Digestive Tonic Tincture or Agni Elixir will greatly help to spark the digestion and metabolism and reduce the symptoms of heaviness after food. Beginning the day with a hot cup of water with lemon and ending the day with Triphala Churna in warm honey water will also be of much benefit. Click here to read more on a Kapha-pacifying diet. Click here for our Ginger, Lime and Honey Digestive Appetizer recipe. Click here to read more on weight loss with Ayurveda. The forth digestive type is known as Sama Agni (translated as balanced fire) and is a clear sign of total health and optimal wellbeing. One with Sama Agni can eat pretty much any food type without unwanted symptoms of indigestion. Their metabolism is balanced as well as their appetite. After eating a meal there is energy, vigor and a sense of lightness. The bowels are very regular with fulfillment after. The stools have the consistency of a ripe banana, no foul smell and often float in the water. Gas, belching and bloating are very rare. The tongue is clean of any coating and the breath is fresh (even upon awakening). An individual with Sama Agni, or a balanced digestive fire, will be in a balanced emotional state. Although these individuals are able to eat even the worst of foods without ill effects, one should still maintain a healthy diet according to their body type and current season in order to sustain this wellbeing that is so hard to obtain. Here is a brief chart that shares some of the general factors for diagnosing and maintaining Sama Agni. 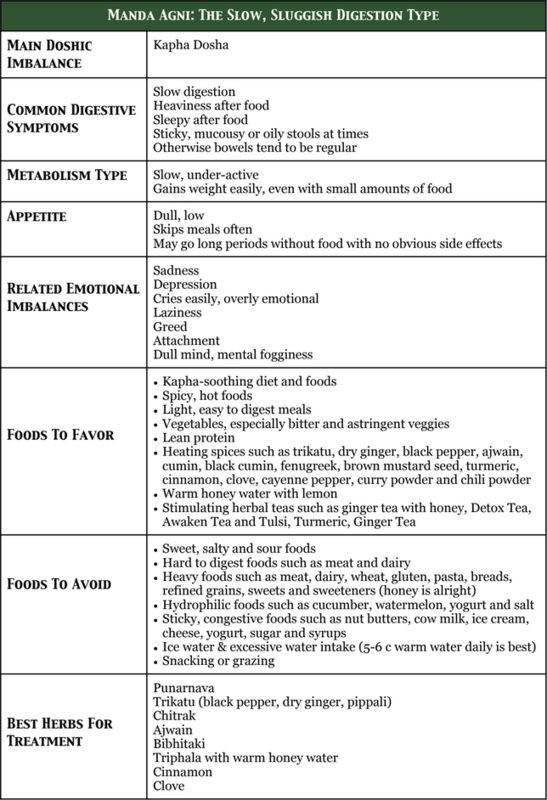 Although your digestion type may be the same as your personal Ayurvedic body type (i.e. Vata, Pitta, Kapha), it can just as easily be a completely different dosha-related digestive imbalance. For example, a Kapha predominant individual can often show signs of Vata type digestion, presenting symptoms of constipation, gas and bloating. Therefore it is important to analyze the specific digestion symptoms you are currently experiencing in order to properly treat the imbalance. 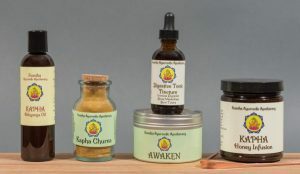 If you are experiencing symptoms of a multiple origin, it will likely be best to go with the one that is presenting with the most symptoms, while keeping in mind your predominant dosha type and the current season. For example if one is experiencing acid reflux, loose stools and cranky hunger but also occasional gas and bloating, they should go with a Pitta-soothing diet and the other Tikshna Agni recommendations above, especially if they are of a Pitta nature and it is in the late spring or summer season. 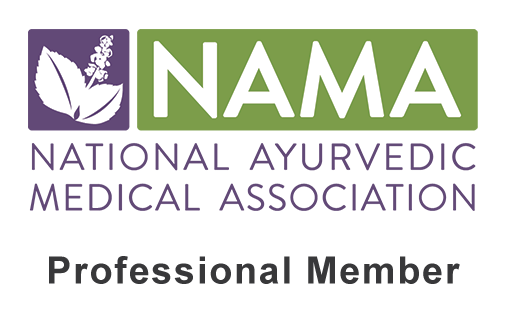 IMPORTANT NOTE: If you are suffering from chronic, severe digestion issues, it is always best to seek personal treatment with a knowledgeable Ayurvedic practitioner. Knowing your Ayurvedic digestion type is equally as important as knowing your dosha type when considering the best diet and herbs for your personal needs. Our digestion is the main factor for our overall wellbeing. It can create disease when imbalanced or bestow us with optimal health, energy and vitality when it is strong and robust. No matter if you are looking to alleviate illness or maintain health, eating for your digestion type will be an essential factor for your success! Click here to see our complete apothecary menu.